Betsy discovered my website and called me about building a "beachy" looking window for her vacation home in Orange Beach, Alabama. She lives a few hours away in Marion, Alabama, but visits just as often as she can get away. Her beach house is only a few miles from my home. Betsy wanted her stained glass window framed and ready to hang in her small kitchen window. Her view for decades has been the side of her neighbor's house. Our challange was to create a colorful beach themed window that would brighten up the room and block the view of the neighbors house. Also, we wanted to build the window to fit closely in the opening to cover the rather dated aluminum window frame. Betsy knew exactly what she wanted, ok'd my drawing, chose her colors, and the project got started quickly. Fortunately, Betsy's husband measured well, I built to size, and our window fit perfectly into place. I'm a little biased, but I think our collaboration came out very well! 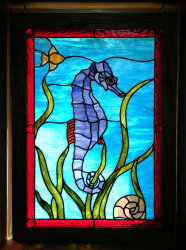 She particularly liked a window on my site called Arlene's Seascape, built in 2007 for a lady in Cape May, New Jersey. Arlene's window was about 4 times the size of Betsy's Window, so we had to trim the design a bit to get the seahorse to fit. 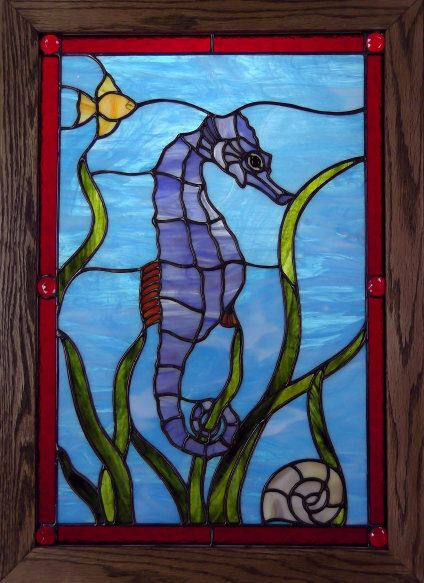 We used the same glass for the seahorse, but chose other glass to give Betsy's window a different feel. Betsy's Window measures about 17" x 23.5" including its stained and varnished red oak frame. It contains 125 pieces of stained glass and was finished in April, 2013. It now enjoys its new home with Betsy and her family in Orange Beach, Alabama. 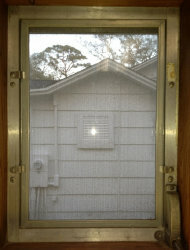 Betsy's graciously sent me pictures of her window before and after installation. The above photos show the dramatic contrast. Now, when Betsy is entertaining family and friends at the beach, she will have her own beach....... right in her kitchen!